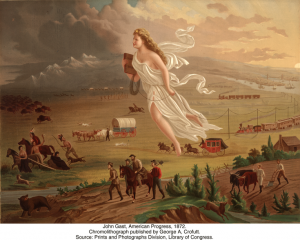 Historian Martha A. Sandweiss demonstrates how John Gast’s 1872 painting, which was widely disseminated as a commercial color print, conveys a range of ideas about the frontier in nineteenth-century America. John Gast, American Progress, 1872. Chromolithograph published by George A, Crofutt. Source: Prints and Photographs Division, Library of Congress. John Gast, a Brooklyn based painter and lithographer, painted this picture in 1872 on commission for George Crofutt, the publisher of a popular series of western travel guides. Few Americans saw the actual painting, but many encountered it in reproduction. Crofutt included an engraving of it in his guidebooks and produced a large chromolithographic version for his subscribers. The painting is so rich in detail that my students—encountering it as a slide projected on a screen—usually imagine it to be a large canvas. But in fact it is tiny, just 12 3/4 x 16 3/4 inches in size. I use this image early on in my western history classes for several reasons. First, even students with little experience in talking about visual images find it easy to talk about what they see here. Second, students quickly grasp that although the painting does not convey a realistic representation of actual events, it nonetheless expresses a powerful historical idea about the meaning of America’s westward expansion. This sparks a discussion about the ways in which ideas—whether grounded in material fact or not—can both reflect and shape human actions. Finally, after a discussion of the larger cultural ideas embodied in this image, we move to a discussion of Frederick Jackson Turner’s celebrated 1893 essay, “The Significance of the Frontier in American History.” Students quickly perceive that while Turner had a way with words, his argument was not wholly original. He distilled ideas already present in American popular thought and many of them are present in this painting, painted some two decades earlier. As students begin to describe what they see, they quickly realize that they’re looking at a kind of historical encyclopedia of transportation technologies. The simple Indian travois precedes the covered wagon and the pony express, the overland stage and the three railroad lines. The static painting thus conveys a vivid sense of the passage of time as well as of the inevitability of technological progress. The groups of human figures, read from left to right, convey much the same idea. Indians precede Euro-American prospectors, who in turn come before the farmers and settlers. The idea of progress coming from the East to the West, and the notion that the frontier would be developed by sequential waves of people (here and in Turner’s configuration, always men) was deeply rooted in American thought. Then, of course, there is that “beautiful and charming female,” as Crofutt described her, whose diaphanous gown somehow remains attached to her body without the aid of velcro or safety pins. On her head she bears what Crofutt called “the Star of Empire.” And lest viewers still not understand her role in this vision of American destiny, he explains: “In her right hand she carries a book—common school—the emblem of education and the testimonial of our national enlightenment, while with the left hand she unfolds and stretches the slender wires of the telegraph, that are to flash intelligence throughout the land.” The Indians flee from progress, unable to adjust to the shifting tides of history. The painting hints at the past, lays out a fantastic version of an evolving present, and finally lays out a vision of the future. A static picture conveys a dynamic story. The ideas embodied in this painting not only suggest the broad sources for Turner’s essay about the importance of the frontier in American life, they suggest that his essay reached an audience for whom these ideas were already familiar. Students often imagine the issues raised by visual images to be peripheral to the more central questions raised by literary sources. The Gast painting, however, allows one to demonstrate the ways in which painters, too, could engage large historical questions, cultural stereotypes and political ideas, by using a visual vocabulary that viewers found both familiar and persuasive.